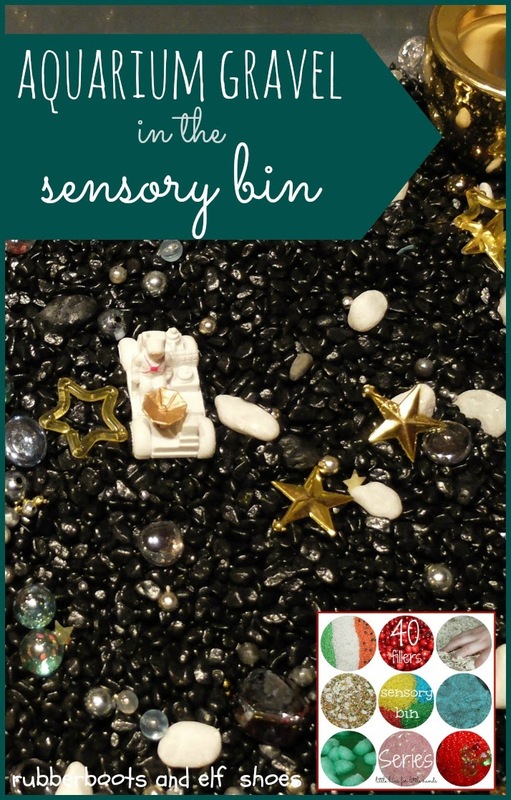 It's Day 16 of Little Bins for Little Hands' 40 days of sensory bin fillers. 40 days. 40 bloggers. 40 different sensory bin fillers. Now that's a sensory bin fix! One of my go to sensory bin fillers is found at your local pet store. It has a wonderful texture. It comes in all sorts of colors - bright, natural and multicolored. It has many different "personalities". Everything from neon loud to thoughtful neutrals. It makes a satisfying clinking sound when poured into or from a container. It happily mixes with other fillers. It "plays well with others". And that is why I like aquarium gravel so much. It plays well with others. It provides a wonderful backdrop to other sensory materials and small world play items. 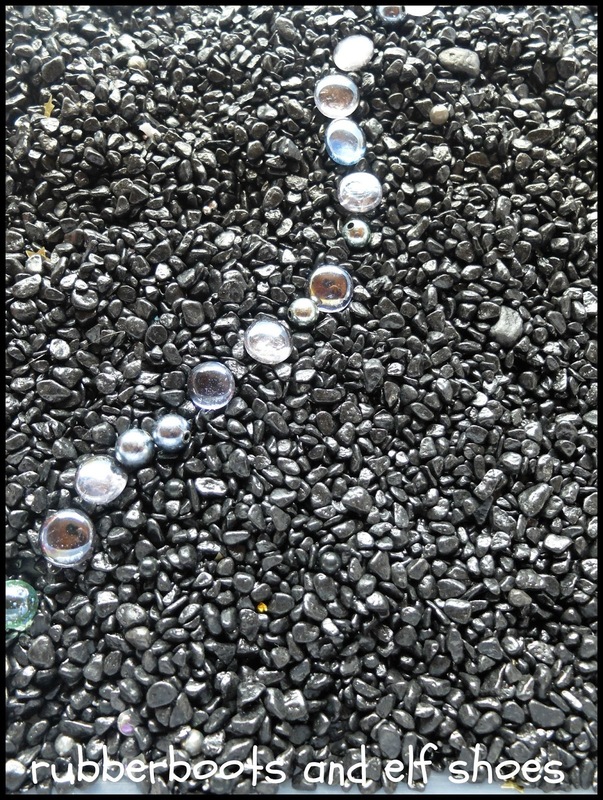 Black aquarium gravel transforms itself to the inky blackness of space. 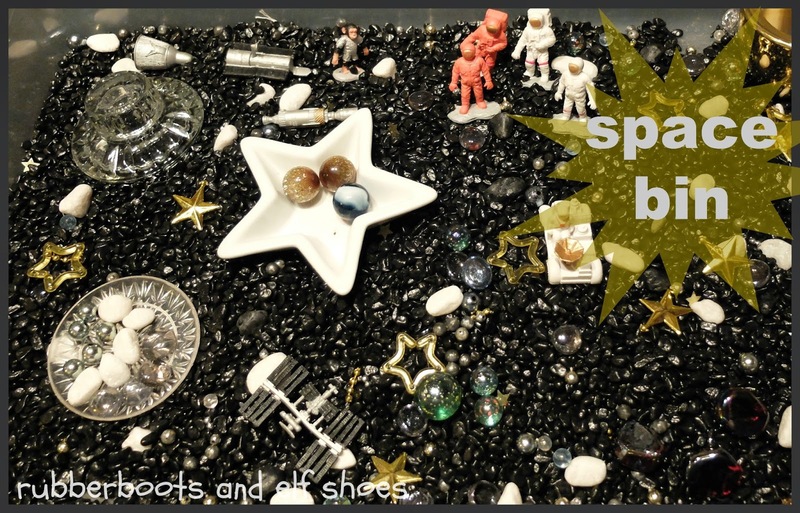 With the addition of the Space Toob figures, various stars (from garlands and linky bracelets and table confetti), planets (gems and marbles of varying sizes), asteroids (white floral rocks) and a few space connected dishes, the inky blackness becomes an engaging final frontier. Black gravel is also the base for one of my favorite bins. This bin grew out of left over black gravel (from the space bin), black buttons and black gems. And then it took on a life of its own. It ended up being the "bling bin". No small world elements. Pure sensory experience. 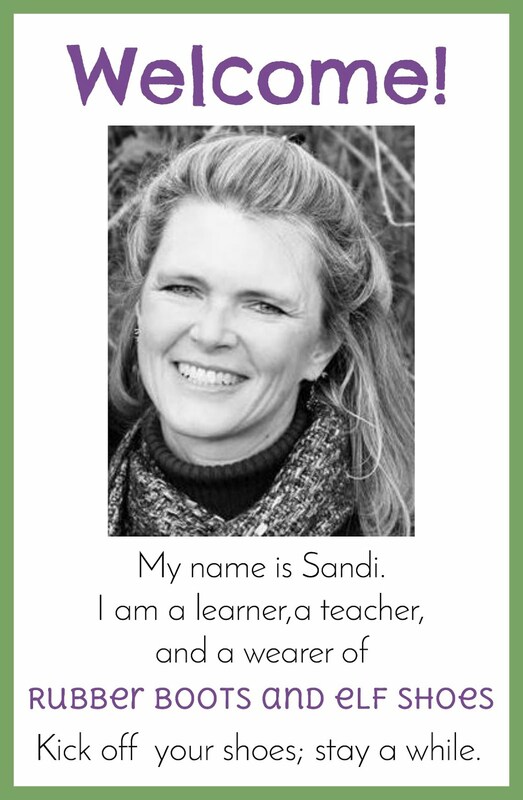 Click on the graphics to go to each sensory bin post. 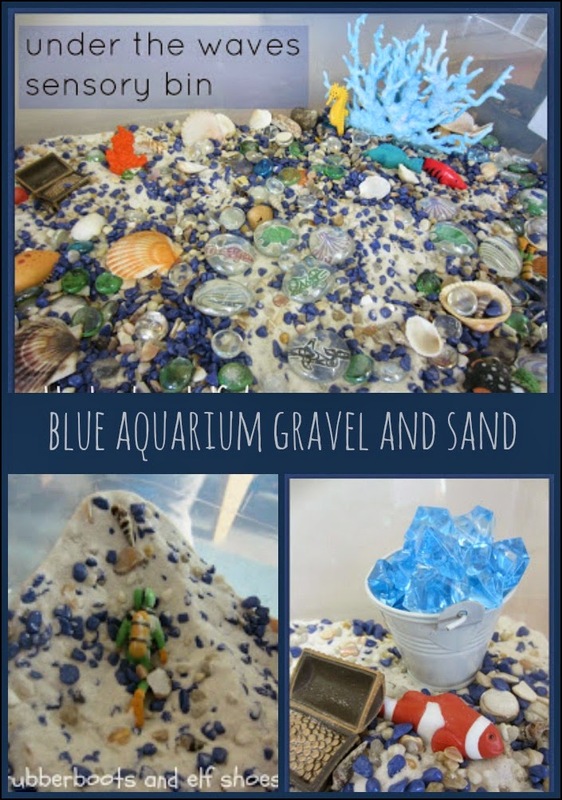 Blue aquarium gravel is a natural for ocean/sea life/water connected sensory bins. 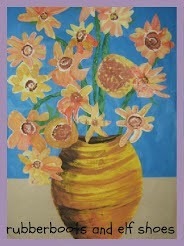 Again it was expected to play well with others. In the Under the Waves bin, dark blue gravel was mixed with sand. The mixture of the hard irregular shaped gravel contrasted well with the soft sand. Great for sifting through little hands. 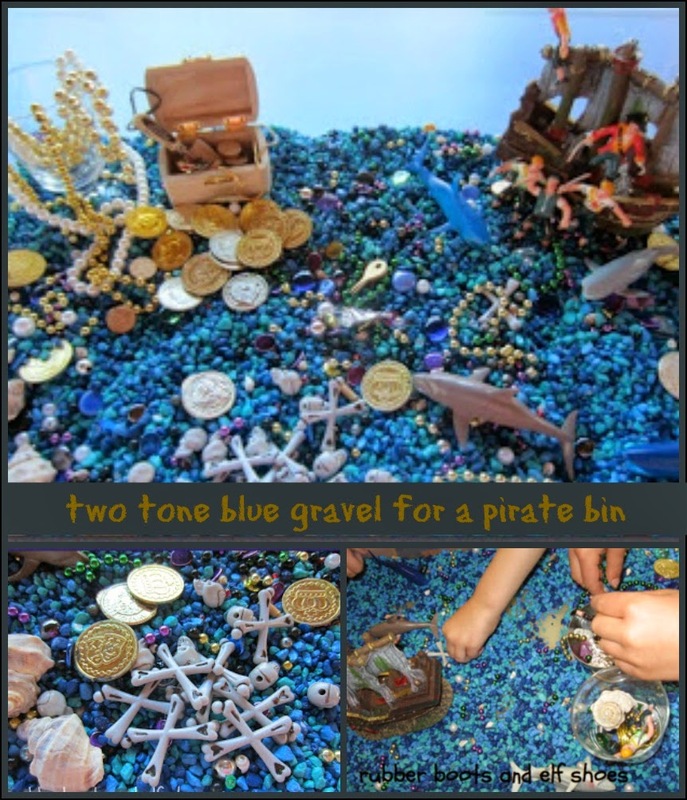 Even if pirates don't share well, the two toned blue aquarium gravel in our pirate bin was expected to. I have a hankering to make a bin with some outrageous neon colored gravel … hmm. We love aquarium gravel and these are awesome ideas! We have yet to try a space them but I plan on it now! 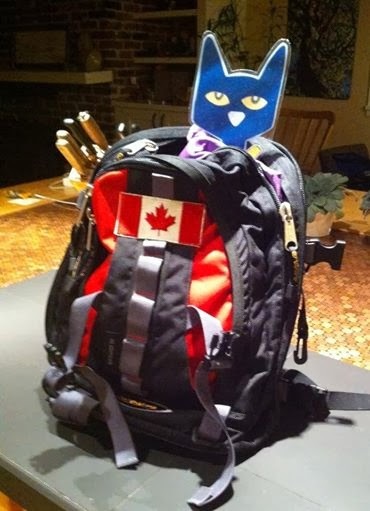 More great ideas for my classroom bins, thank you for sharing. My kids love these bins and beg for me to make more. The St. Patrick one is appearing at school today.